If you’re a noodle fanatic like me, don’t miss today’s recipe: Lanzhou beef noodle soup (兰州牛肉面). Super aromatic, tangy and comforting, it’s one of the most popular noodle dishes in China. Named after the city from which it originates , this famous beef noodle dish is synonymous with Lanzhou and one of the most important elements of the local food culture. I spent all my teenage years in Lanzhou (兰州), the capital of Gansu province in the Northwest of China, and Lanzhou beef noodle soup was a regular breakfast treat. In a small cafe beside my school, hundreds of bowls of beef noodle soup were freshly made each morning by a skilful team in a tiny kitchen. Although the queue was long, the service was always super fast and the taste was always spot on. To me, it’s what I miss the most after moving from Lanzhou. Every time I go back, I take every opportunity to enjoy this humble yet scrumptious delicacy. The making of Lanzhou beef noodle soup is truly a culinary art. Have a look at this video clip that I shot on my 2018 Culinary Tour of China which shows you the fascinating process. Words just can’t describe it. Strictly speaking, Lanzhou beef noodle soup is not supposed to be homemade. Or, let me put it another way. It’s almost impossible to imitate it, particularly the rich, aged beef broth (Restaurants claim they have secret ingredients, formulas, etc.) and the sophisticated hand-pulled noodles (it can come in 7 different sizes). That is why I’ll never dare to claim that I make authentic Lanzhou beef noodle soup. What I’m sharing today is a simplified version which can be easily made in your own kitchen. A nice bowl of Lanzhou beef noodle soup consists of six essential elements: clear, aromatic beef broth; cubes / slices of cooked beef; melt-in-your-mouth daikon (aka mooli or Chinese white radish) slices; elastic hand-pulled noodles; generous amount of chilli oil and fresh coriander or green garlic to garnish. In my recipe at the end of the post, you will see a long list of spices used to flavour the beef broth. Find as many as you can. Believe me, they do make a difference! For better flavour and texture, I recommend you choose the beef cuts which have generous amounts of marbling. Apart from beef, I also add some beef bones. They provide extra flavour and a nice amount of fat to the broth. I usually make hand-pulled noodles (shown in images above) for this dish but I have to admit that it’s quite time-consuming and does require a pair of skilful hands. 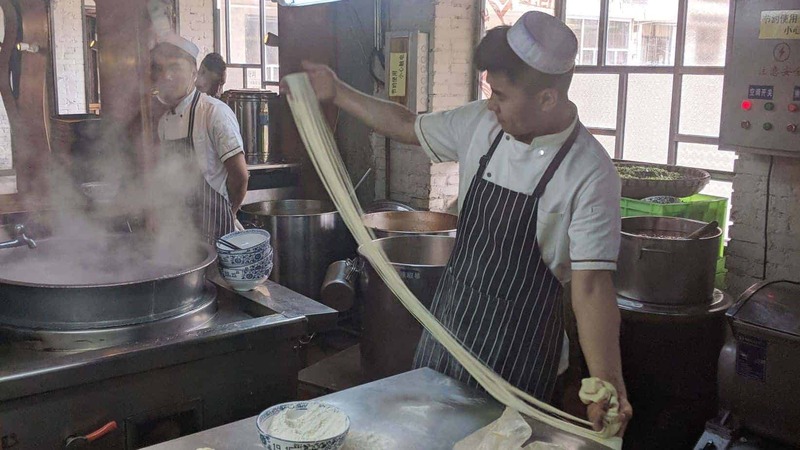 I have a separate post “Xi’an Biang Biang noodles” which shows how to make hand-pulled noodles. Have a look if you are keen to sharpen their culinary skills. Please feel free to use shop-bought dried noodles. They are so handy when you are in a rush. To me, chilli oil (Read my recipe HERE) is indispensable for Lanzhou beef noodle soup. It gives the dish an extra zing, as well as a more appetizing look. Some people also like to add some Chinese black vinegar, have a try if you wish. Put beef chunks and beef bones into a pot filled with cold water. Bring the water to a full boil. Use a spoon to skim off the froth on the surface. Add all the herbs and spices (see note 1). Leave to simmer for about 2 hours (until the beef is cooked through). Take the beef out to cool and discard the bones, herbs and spices. When cold, cut the beef into either thin slices or small cubes(see note 2). Cut daikon into thin slices. Put into the beef broth. Cook for 15 minutes or so until very soft to bite. Cook noodles (see note 3) in another pot with plenty of water. Drain and rinse under cold water for a few seconds. Place noodles in serving bowls. Pour in hot broth and daikon. Top with beef slices / cubes. Garnish with fresh coriander and homemade chilli oil. 1. If available, use a closed tea strainer to keep spices together while simmering. Later you will be able to discard them easily. 2. I suggest that you leave the beef to cool completely (best to be in the fridge overnight). This way it won’t fall apart when cutting through. 3. The noodles can be hand-pulled (authentic version) or shop-bought(quick solution). Writing this post has made me very homesick. Fortunately during my upcoming Culinary Tour of China, I will travel with my tour members to Lanzhou and we will have a private audience to view the making of Lanzhou beef noodles. Really looking forward to that! Next How to prepare a Chinese themed dinner party? This looks delicious!! I want a bowl right now! Thanks Heddi! You really need to go to Lanzhou to have it!